Harris County Historical Commission unveiled a historical marker May 12 at the Morse-Bragg Cemetery, 66 South Wynden Drive, one of the only surviving reminders of the pioneer history of Houston's Galleria area. The historic burial ground is the last remnant of Pleasant Bend Plantation, which was founded in 1851 by Agur Tomlinson Morse (1801-1865) and his wife Grace (1814-1890). Before the Civil War, the Morse holdings grew to cover nearly eight square miles, including much of modern-day River Oaks, Tanglewood, West University Place, Southside Place and the Post Oak-Galleria area. Among those interred in the cemetery are Thaddeus Bell (1822-1871), the first Anglo male born in Stephen F. Austin's colony, as well as members of the African-American Banks family and at least seven Confederate veterans. The cemetery was largely intact until the 1980s, when development pressures began to take a toll and all but two of the headstones were stolen or destroyed. Descendants of the Morse and Bragg families and Harris County went to court to protect the cemetery in what turned out to be a decades-long effort. 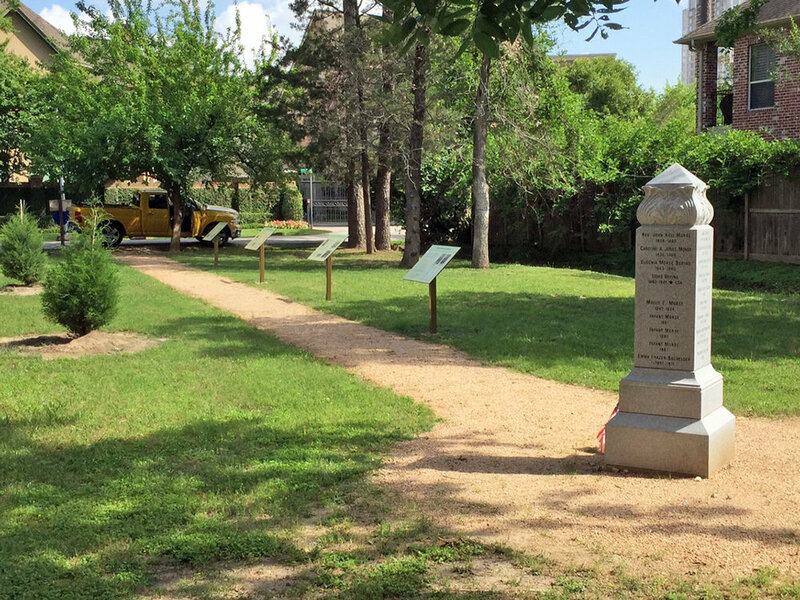 The Morse-Bragg Cemetery Association, formed by the families, funded the creation of interpretive panels describing the history of the site and the installation of a granite monument with the names of those buried in the cemetery. Harris County Precinct 3 will maintain the green space as a Harris County Historical Cemetery.